The Model 620 is a totally-enclosed, double-insulated, multi-switch program timer that eliminates the need for additional grounding. It is equipped with an incremental advance drive with several different drive speed options. It has an integral motor and gear train with no external motor wires. All connections are through a multi-connection, plug-on termination block for quick wiring hook-up. Up to 8 single-pole, double-throw (SPDT) 15 ampere 1/2 HP switches are available. A shaft-operated line switch, with an option of breaking all circuits, is also available. Other options include a positive shaft-setting detent, bi-directional setting. Quiet Cycle Selection (QCS), single-throw or double-throw sub-interval circuit with optional masking lever, and snap-in or slide-in mounting option. Contact Midwest Timer today for more information. 24 minutes to 3.6 hours cycle time. Permanent magnet, 24 VAC, 115 VAC or 230 VAC nominal voltage inputs at 50 Hz, 60 Hz or 50/60 Hz. Motor leads internally connected. .312" (7.92) x 1" (25.4) standard. Others available. 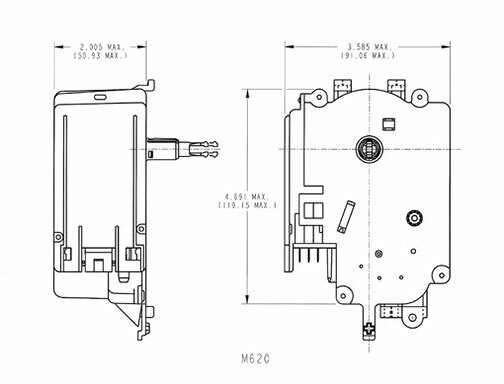 Standard snap-in and screw mount designs available.